Staff at St John’s Secondary School and Sixth Form College in County Durham recognised that they had a wide gap in attainment between their higher and lower achievers but concerted efforts had failed to improve the situation - until they turned to Erasmus+. Since embarking on the ‘Narrowing the gap between higher and lower achievers’ project, the school has been able to improve the outlook for its disadvantaged students and reinvigorate its staff. “Our Erasmus+ project was driven by one thing, the need to improve our ability, as educators, to help our disadvantaged students who are not progressing as well as their more socio-economically better off counterparts”, said Philip Robertson, international development lead at St John’s. “For three years we had been looking at this and for three years we had not made any progress. We needed to effect change; to improve the life chances for our disadvantaged students; and to narrow the gap between these learners. “We wanted to bring about transformational change through supporting new practices in key areas that we felt contributed to our disadvantaged students’ poor results. We looked at assessment for learning (AFL), homework, differentiation for boys and girls, innovation in pedagogy and independent learning across five subjects - Modern Foreign Languages (MFL), Science, Maths, Art and Music. "We selected six top practitioners from our school staff - senior and middle leaders, outstanding teachers and support staff - who are all passionate about helping those students who are not getting what they deserve under the current system of teaching and learning in the UK. "They were offered the opportunity to job shadow for a week in our partner school, in La Coruña, and bring best practice back home to share across the whole school. Not only did we believe that this would help narrow the attainment gap but our staff would also benefit: improve their language skills; develop confidence and project management skills; and perhaps take part in future cross-curricular projects in Spain and beyond. “During the week of job shadowing we worked very closely with our partner - observing lessons across the school and shadowing teachers and students," Philip went on. "We had in-depth talks with key stakeholders looking into the tracking systems, support network and, most intriguingly, the parental engagement that it adopts to ensure that all students progress. "We were immersed in the cultural, musical and linguistic nature of the school and the results were incredible. We were able to witness not only the day-to-day teaching and learning that our focus group of disadvantaged students received but also the way they were treated and supported, in and out of school, by highly skilled practitioners. "We experienced a totally different approach to ours; students were free to express themselves and were motivated to learn." 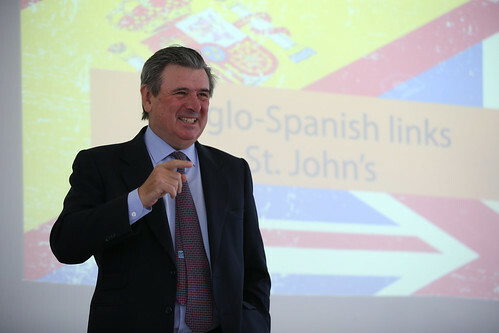 The project evolved daily while St John's staff were in Spain as they saw things that their original plan had not even thought of investigating. All six brought ideas back to trial in Bishop Auckland - such as using metacognitive approaches like chess and problem solving and, crucially, involving parents much more in their children's education. As a direct result of the Erasmus+ project St John’s made metacognition, or awareness of one's own knowledge, a key priority for the whole school Learning Improvement Plan (LIP). A major eye-opener for the St John's staff was also the role parents played in the Spanish approach. Philip explained: “What the UK team really took away was that everything is underpinned by the relationship with parents and the 'winning culture' that is bred in Spain. Competition, fear of failure and pride in work are key components that we believe, together with solid teaching and learning strategies, led to the Spanish disadvantaged students progressing better than our students. "We have used a more competitive, ‘fear of letting yourself down’ culture with our disadvantaged students and we have witnessed a dramatic improvement in their attitude to learning. “We were also privileged to see the support systems and relationships that the Spanish staff have built with the parents of all students, including the more vulnerable and disadvantaged ones. This exceeded our expectations and allowed us to compare the support and backing that the Spanish parents give to the school and the staff, which really does make a huge difference in the way students perform. "Staff are given time in their timetable to meet parents to ensure that they push their children at home, which leads to a more focused student in class. "We have started to look at all the key points we learned from the project and are using the Spanish model to engage and support parents to motivate our students more, including looking at appointing another Assistant Head Teacher with a focus on this. We believe that the single most important factor of what we witnessed in Spain regarding the narrowing of the gap between learners was the united approach, planning and strategising between staff and parents. St John’s has seen an improvement in levels of progress (LOP) of students in the selected group across all five identified areas, notably a 22% improvement in MFL 3LOP and 17% in Science 3LOP. The school is very hopeful that this improvement will continue to develop as a result of the new approaches adopted. Staff are now more confident in dealing with disadvantaged students and have more ways to support their needs and the project has also created a climate of innovation and the sense of self-ownership for staff development according to Philip. "The experience has meant that our teachers are reinvigorated and refreshed and, due to dissemination through the whole school, all our staff have trailed the ideas we brought home and the project directly shaped the planning for the school’s following LIP. 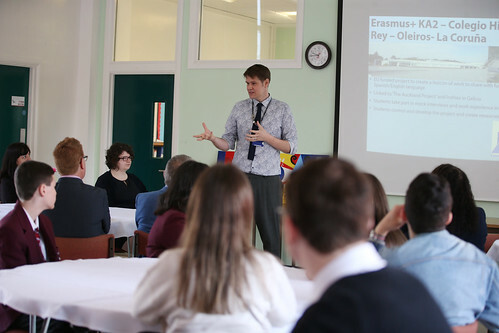 Although the project has finished, St John's plans to ensure that it continues to offer continuous professional development (CPD) opportunities to its staff and exchange opportunities to its pupils and has recently been awarded further Erasmus+ funding to do this. Feeling inspired by St John's story? Learn more about the various funding opportunities for schools.